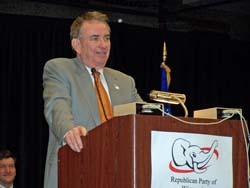 Former Wisconsin Governor Tommy Thompson&apos;s presidential campaign crashed in Ames, Iowa, Saturday as he finished sixth in the Iowa Republican Party&apos;s Straw Poll. Thompson repeatedly said he had to finish first or second in the Straw Poll, or he would drop out of the race. Even before the votes were counted Saturday, it was apparent the size of Thompson&apos;s crowd wasn&apos;t going to carry the day, yet Thompson wasn&apos;t ready to concede. "It&apos;s in the hands of the Lord right now," Thompson told reporters. Sources inside the campaign tell Wisconsin Radio Network Thompson will issue a written statement Sunday evening, confirming his exit from the presidential race. On Saturday, Thompson began his final speech as a presidential candidate with a hat tip to a group the Thompson campaign had dubbed "SOTTs" — Supporters of Tommy Thompson. "I want to thank all of the tremendously wonderful, hard-working volunteers, staff people and the people that traveled all over Iowa to be here today," Thompson began. "Thank you. Thank you for the bottom of my heart." In July, Thompson embarked on a whirlwind tour of Iowa which took him to all 99 counties — a total of 110 cities. "I did it because I wanted to go into the homes and the cafes of people all over Iowa and I want you to know that I learned that the Iowans are wonderful people," Thompson said. "I want to take this opportunity to say thank you, thank you to Iowa for putting this on." Thompson, who stumbled once during his Saturday night speech and referred to campaigning for governor rather than for president, said his party must stress not only its ideas but its ideals. "I believe, just like Ronald Reagan, that we are the party of July 4th and the Democrats are the party of April 15th," Thompson said. "And don&apos;t you ever forget it, ladies and gentlemen." Thompson concluded his speech, perhaps his last speech as a political candidate, with a recitation of his biography. "I&apos;m Tommy Thompson, son of a grocer and a school teacher, wife of Sue Ann, father of three children, five grandchildren, a commissioned officer in the Army Reserves, a proud American, a proud Republican," Thompson said. "And I say to you God love you, God love Iowa and God love the United States of America."